If you haven't read Creativity Inc, on the formation and rise of Pixar by Ed Catmull (one of its founders); you're missing out. As well as a business biography, there are a huge number of philosophical theories on how to best nurture creativity in the film-making process, and how to bring all employees together to make the best product possible. My Kindle informs me that I've highlighted 35 sections in this book - for non-technical manuals, I usually will make around 2 maximum per book. So, it's fair to say that a lot of it struck a chord. I'd like to share a short passage on giving meaningful feedback, which applies to many stages in the film-making process, and certainly not just animation. As an editor, I receive a lot of notes - and sometimes send them out, either on cuts I've made or on scripts and films that other people I know are working on. In drama, it's said that you write a film 3 times: in the script, during filming, and in the edit room. In animation, there's less filming ("performance" being shared between the voice actors and the animators)... but the editing is constant. The bulk of the editing happens at the start with the animatic, to find the structure of the film in order to eliminate as much unnecessary animation as possible - but as additional detail is added, the edit must be revisited again and again. The easiest way to illustrate this is to show you two simple sequences from Q Pootle 5, the preschool series I've just finished editing. Even though we used Redboard for the storyboard and the scenes were set up in 3D space with representative backgrounds, things can still change significantly. And, of course, it's still incredibly basic when compared to an animated shot. Each video shows the animatic more or less as it went into the animation stage (albeit with notes from the producers), a playblast of the animation stage before it went to lighting, and the final version. I've included the full length of each shot from each phase, so there are black sections where there is no video to cover that part of the shot for that stage. N.B. The animation stage shown is the trimmed version that was sent for animation approval - not the full length of each shot worked up which may have had overlapping actions or excess frames. It matches closely to the final version in terms of action, but the difference lies in the level of detail and any additional fine cutting. A useful additional stage would have been the blocking or early animation - but this wasn't available when I came to put this blog post together. Example 1: from "Pootle's New Spaceship"
0:11 - Action changed to Ray (the bird) closing the nose cone rather than appearing, but the 'beat' of the action remains the same. 0:12 - In the animatic, I wobbled the image to indicate Pootle (green) and Stella (brown) climbing in to the spaceship. This action was eventually replaced by Ray's reaction and the sound effect. 0:23 - Engine start time decided in animation, but the false start matches timing. 0:24 - Pootle's blustering was cut down in response to animatic feedback from the producers. The shot duration changed accordingly. 0:30 - Hugely different angle, hence different duration. The new angle allowed the point of the shot to be conveyed a lot more quickly. 0:36 - Filling in the animation and letting the animator work the shot as they wished resulted in different timing for this shot, with a more tentative lift-off. 0:40 - A much more cinematic feel for this shot than depicted in the board. Lovely - and a brilliant case for collaboration and encouraging everyone to not be afraid to try things out that are different to what's already there. 1.01 - End of scene trimmed. The starts and ends of scenes are easy places to add or lose time when cutting to an exact duration. Angles changing between animatic and animation is a common thing - if there's time and it's a big enough change, new boards will be drawn up to illustrate the intended shot; but often it's quicker and easier for the director to just get it worked up in layout and changed to their specification. Example 2: from "The Cosmic Whipple"
0:04 - Adding the rock in the middle of the crater for Oopsy to climb up was a late addition, but added some action to the shot, and was a good opportunity for our most hyperactive character to expend some energy. Of course, this changed the framing a lot from the animatic. And the timing. 0:08 - Blink and you'll miss it: a minor trim to the final at a late stage. A massage of an earlier trim. 0:13 - Shot extended for new action. 0:20 - There were several shots boarded for this short section of varying duration, but I ended up resizing them in the animatic and merging them at that stage. This accounts for the variation in line thickness and framing. Often, I would adapt a storyboard to use in an animatic, if it had an element I wanted. This could mean re-sizing, or using a part of a board to replace a part of another board to clarify timing. This often meant a note was added for animatic approval - but I kept my timeline organised to show that it was all part of the same shot, and the metadata reflected that. Sometimes an animatic would end up being the best approximation of the framing from the available boards - I'd put priority on the composition in terms of whether it was a 2-shot, wide, close-up etc. If you've read the previous parts of this series, this is the part which has the least 'editing' involved - and also the stage where most of the raw materials for the action are together and now fully staged and animated - basically the part where for drama, the editor would start. However, because we don't have multiple readings from multiple angles and very little in the way of handles, the creative job's basically over. However, there's still work to be done - and elements to be added which will affect the optimal cut point of any two shots. Among the people I know from the National Film and Television School is Helen Piercy - with whom I have previously worked on an animated sonnet by Shakespeare voiced by Alan Rickman, and various school projects. 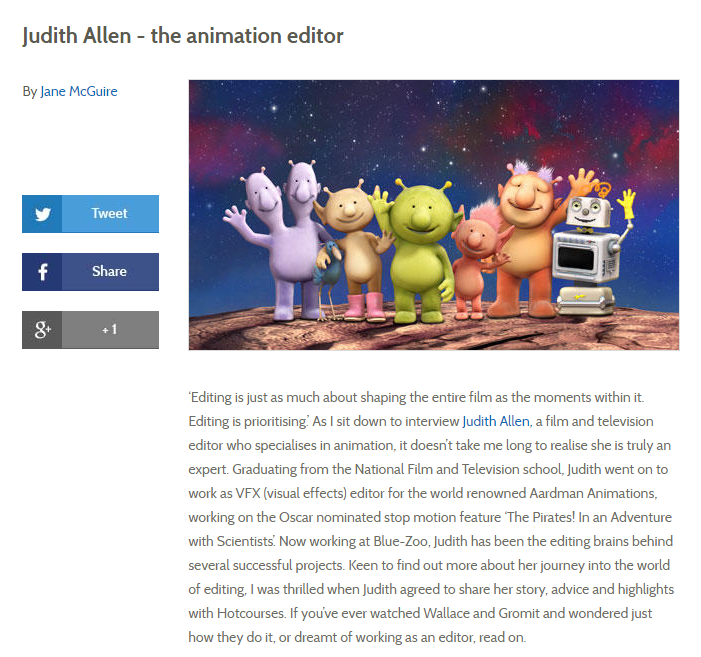 Helen is currently doing a lot of work with children and young adults in the form of animation workshops across the UK, and as a result was approached last year to write a book/ kit to help children make their own animations. This book has now been released, and it's fantastic. I have a copy in my edit suite, and it's a big hit with the animators (and others) at the studio. The age guide is ages 8+, but there have already been reviews from much younger children starting to make their own films using the book and kit as a guide. Animation Studio is available at Amazon (UK), Amazon (US), and various bookshops.